Audio: “Second French Fort” featuring Tom Castaldi. Courtesy of 89.1 WBOI. In 1750 French leaders announced the old French fort in Fort Wayne, Indiana along the St. Mary’s river was no longer livable. They decided to build a new fort, called Fort St. Joseph. This fort would be closer to the Miami settlement of Kekionga. However, by the time the French had built their new fort, they had lost the friendship and alliance of the local Native Americans. The Indians had changed over their alliance to the British, in part due to their more attractive trading endeavors. In 1755, at the outbreak of the French and Indian War, the French surrendered to the British and also surrendered Fort St. Joseph. In 1760, the Fort was then occupied by Lieutenant John Butler and his men. All French power that was once in the Old Northwest Territories was handed over to British authorities. The British alliance with the Indians did not last long and quickly declined. This was because of many reasons including broken promises, arrogant traders, and withheld gifts. The Native Americans throughout the Great Lake region had enough of the British and were determined to drive them out of their region. One act of this was deemed “Pontiac’s Rising,” of 1763. 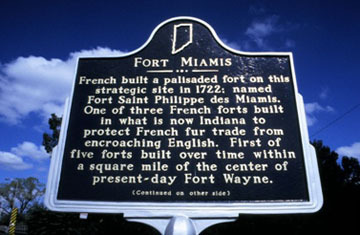 At Fort St. Joseph, now renamed Fort Miami, the British were preparing for battle, once three of their soldiers were killed by the Miami on May 25, 1763. Robert Holmes, in charge of a small barracks, ordered the fort closed and prepared for siege. Holmes didn’t use caution though and got caught in a trap designed by the Indians. He followed a young Indian woman who said a fellow native woman was ill and needed help. Holmes didn’t see any reason to doubt this young woman; however as he followed her, two muskets appeared and shot Holmes to death. This story exemplifies the quick decrease of power and fall of Fort Miami. The Indians of the region for the next thirty years enjoyed not having British soldiers control the barracks of the Fort. During these years, the Indians, notably the Miami, emerged at the headwaters of the Maumee River. This area would eventually draw Indians from all around the region and a large settlement would become known as Kekionga. These tribes gathered and were brought together all sharing the hatred of the American intruders from the east.